It was only about a month ago that I blogged on Chic little consoles for small entryways, but I have to revisit small entry spaces! We went to the Kips Bay Decorator Show House (through Nov. 11th) in New York, and were captivated by this wonderful small nook of a space. So many of the rooms in the show house are a bit over the top, but this little area caught our eye. My husband's comment was 'it's yet another example of the smaller the space, the better it looks if you cram it full of wonderful things!' The lovely little console table is topped with flowers and vases, and the sculpture on the floor adds even more interest. The oriental style lantern is wonderful and the sconces bring more mood lighting options. The walls were a wonderful deep blue lacquer. I could go on! I thought I'd 'decorate' a few entryways with a wonderful console table and a great light fixture from auctions. Just add a vase of flowers and a few decorative objects, and you have a good start to a great entryway! This chic Art Deco style console table is made of iron, steel and stone. It's French and sold at Doyle New York for $3,750. The subtle detailing is wonderful. Pile it high with vases and flowers to draw the eye to an entryway or down a hallway. 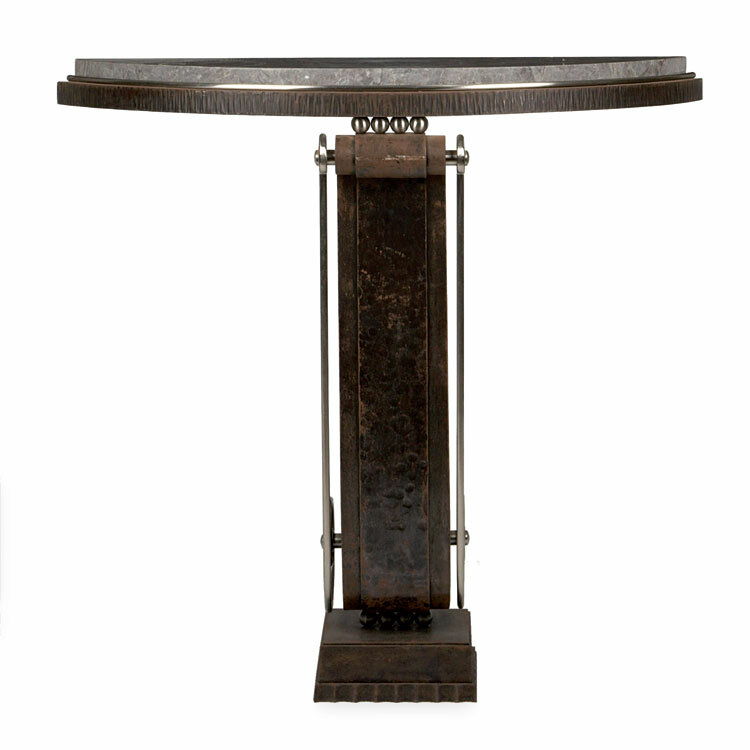 This Art Deco glass and metal chandelier would make a great pairing with the console table above. This sold at a Christie's Interiors sale earlier this year for $125! It had an auction estimate of $1,500 - $2,000 so it went for a song! 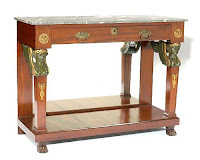 The last St. Charles Gallery in New Orleans would have been a perfect place to start for the Asian inspired console table and lighting. 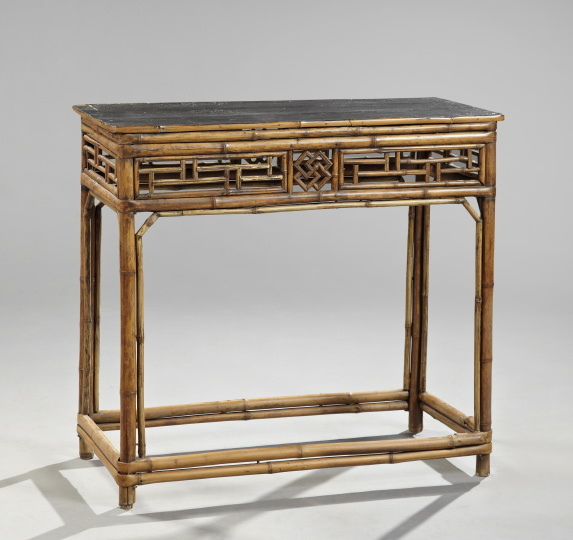 This wonderful Chinese bamboo console table is from the 1st quarter of the 19th century, and sold for $861. You may remember my blog on 'Faux bamboo chic', but this is actually the real thing. Very smart looking. 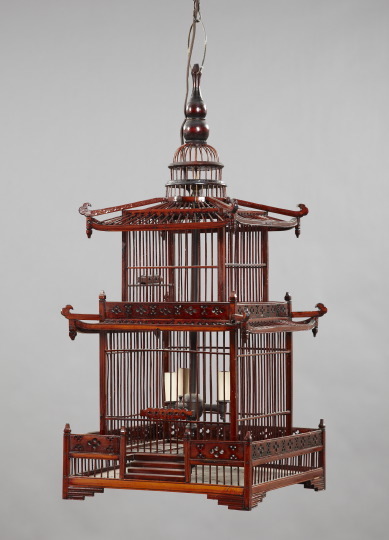 At the same St. Charles Gallery auction this Chinese rosewood birdcage, converted in to a lantern is 32" tall and sold for $215! This is the height of chic and I can't believe it sold for that. If you paired this lantern with the console above, you might have money left over for a buddha statue or maybe a wondferful Chinese vase to put on top of the console! 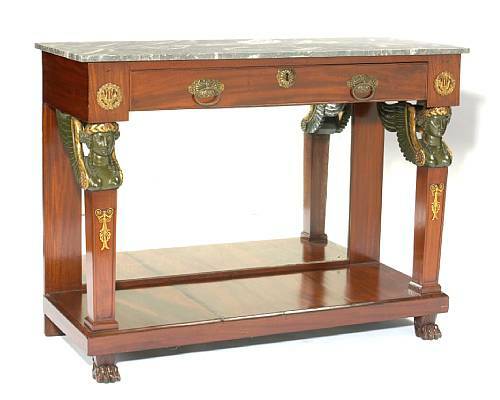 When it comes to classic antiques I have a soft spot for Neoclassical. I love the tailored lines. 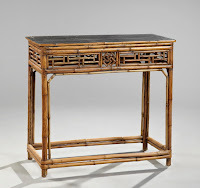 This early 19th century Continental console table sold at a Bonhams Los Angeles auction for $2,440. I love the carved heads, paw feet, and marble top. It also has a mirror in the back so that you can check out your skirt hems as you enter! I would pair this console with a classic lantern. 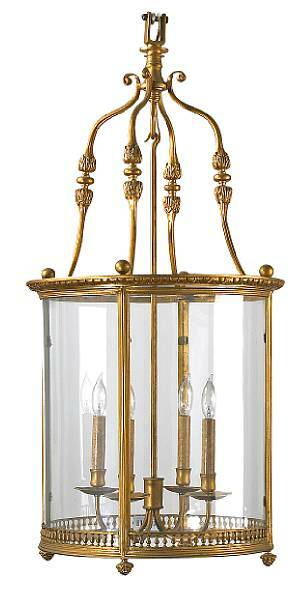 This is a simple example of a hall lantern and was included in a Bonhams auction in San Francisco. This is late 19th century Louis XVI style, 31" tall, and sold for $1,708. The entryway sets the tone of your style for those entering your home. Have fun with it, and don't be shy about cramming it full of wonderful things!